Multi-Variant Execution Environments (MVEEs) are a promising technique to protect software against memory corruption attacks. They transparently execute multiple, diversified variants (often referred to as replicae) of the software receiving the same inputs. By enforcing and monitoring the lock-step execution of the replicae's system calls, and by deploying diversity techniques that prevent an attacker from simultaneously compromising multiple replicae, MVEEs can block attacks before they succeed. 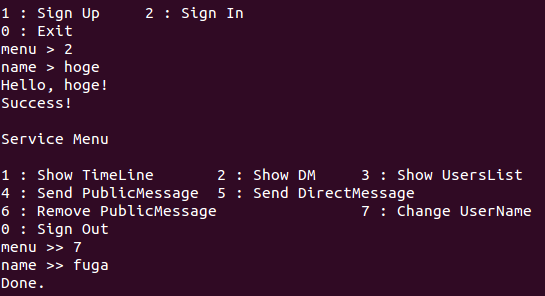 S.Volckaert+, "Multi-Variant Execution of Parallel Programs"
"2 : Register\t3 : Remove\t4 : Modify\n"
"5 : Change List Format\n"
"1 : Sign Up\t2 : Sign In\n"
"1 : Show TimeLine\t2 : Show DM\t3 : Show UsersList\n"
"4 : Send PublicMessage\t5 : Send DirectMessage\n"
"6 : Remove PublicMessage\t\t7 : Change UserName\n"